Since our last Blog swap was so sucessful that Meeta and I decided to have another, our tastes and ideas about food are so similar it's hard to believe that we have never met. Check out Meeta's posting over at my site Posie's Place. Since the whole of Europe has been sweltering under a heatwave for the past couple of weeks, Meeta's theme for the Monthly Mingle is very appropriately "Beat The Heat", in addition we decided to use this theme for our swap. So now I had my main ingredient in mind, what would help "Beat The Heat" ? 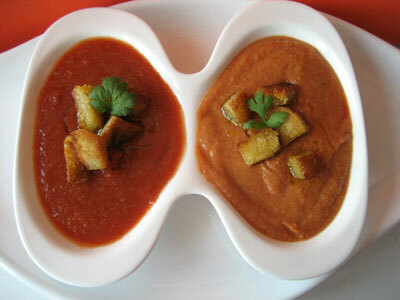 Gazpacho!! Delicious chilled soup of tomatoes, cucumber, peppers, here goes..
Chill well in the fridge for a minimum of 1 hour but preferrably overnight as the flavours develop over time. As a twist I took 500ml of the final gazpacho and added half a ripe avocado, the two were blitzed until smooth in a food processor. 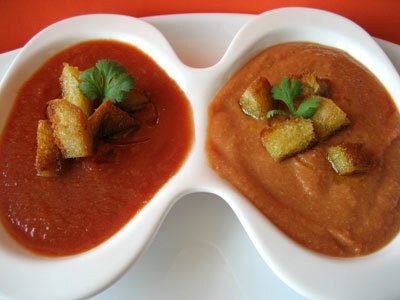 Two different versions of gazpacho to be enjoyed on a hot summer day! Enjoy! wow ... Dont have words for it...loks sooo good meeta. Where do u get such cute cutlery from ? Neelu - I bought the dish at a little shop just over the border in Germany. Meeta - Brilliant blog swop again, your post looks great on my site and I'm very happy with mine too! Neelu, Pam has also some great recipes on her blog make sure you check them out.